Nine days of constant movement. Nine days in a boat, unable to stand. Nine days with the fear of being hit by a tropical storm, thousands of miles from rescue. The Pacific Ocean is big. Far bigger than one would imagine. This is the journey to the island at the end of the earth. Part of the Cook Islands, Palmerston is one of a handful of islands connected by a coral reef which surrounds the calm waters of a central lagoon. But within this entire area the reef sits too high in the water for sea planes to land – and outside it the ocean is simply too rough. It is also too far from anywhere for a normal helicopter to fly to. The sea is the only access. So getting there is not easy. After two days of flying – from London via Los Angeles – we set off by boat from Tahiti. After five days of sailing in our small yacht, the clouds turn a menacing black. The strength of the sun has gone and a worrying chill hangs in the air. A sudden clatter of heavy rain hits the side of the boat. A bolt of lightning strikes the sea. With the sail at full height, the strength of the wind pushes the boat over a full 60 degrees, dragging us sideways through the water. There’s very little that can be done once the sail has dropped – the boat is at the complete mercy of the elements. And there is no-one to help. During nine days at sea we see nothing. No other ships, no wildlife, and no aircraft – not even at 50,000 feet. Nothing. 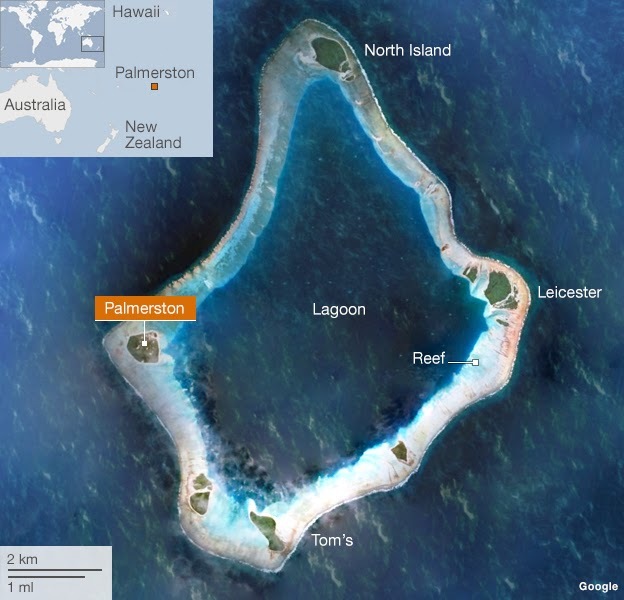 This extreme journey prevents all but the most determined of visitors from ever reaching Palmerston, a tiny patch of green surrounded by thousands of miles of ocean. The height of the island means it is not visible until just two miles away and in bad weather it’s simply impossible to see. Over the years, tens if not hundreds of boats have hit the reef hiding just below the waves, leaving the sailors stranded. The latest wreck, brought down just three years ago, sits on the beach with a gaping hole in its side. The parts of these ships – engines, wooden planks and masts – have been salvaged by the islanders and re-used. Nothing goes to waste here. William Marsters was Palmerston’s first permanent inhabitant 150 years ago. I was told – with some confidence – that he had sailed with Captain Cook’s ship as a carpenter. But while the famous explorer died in 1779, William wasn’t born until at least 1830. Marsters lived in the Cook Islands from the 1850′s and in the early 1860′s, he was appointed caretaker of Palmerston by its then owner, a British merchant, John Brander. He moved there in 1863 accompanied by his wife, a Polynesian woman, and two of her cousins. Today, all but three of the residents are direct descendants of William. “Welcome to my world, a land of white sands and coconuts. Nothing goes wrong in Palmerston,” says Bob Marsters, a resident of the island. 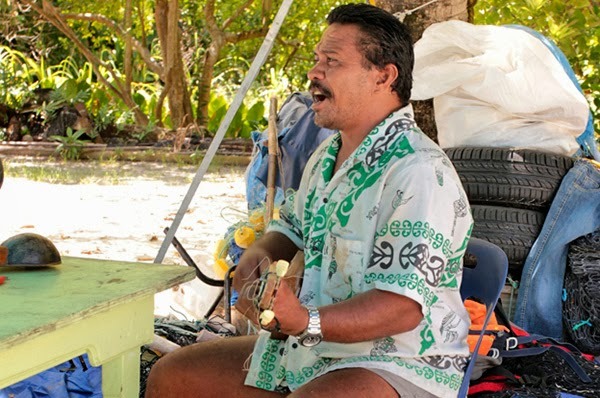 “Eh boy, grab these fellas a coconut – drink, drink.” Bob’s son knocks off the top of a coconut using a machete and I sit down on a plastic garden chair and drink. I listen to the wind rippling through the leaves of the palm trees. Then, in one of the most surreal moments of my life, surrounded by 3,000 miles of open ocean, I hear one of the islanders listening to her favorite song. Not a gently lilting melody but rather, “Boom, boom, boom – Vengaboys are coming” – the distinctive sound of cheesy Euro dance pop. Officially a New Zealand protectorate, Palmerston receives many of the modern amenities that we take for granted. Housing, power (for a couple of hours a day), the internet (for a couple of hours a day), even – for a lucky few – a mobile phone signal. Yet the people of Palmerston have no shop, just two toilets, and rainwater is collected for drinking water. Money is only used to buy supplies from the outside world – not from each other. “That’s one thing I’m so proud of with the families living on Palmerston – we work together, we love each other and we share,” says Bob. “For instance, when I’m out of rice or flour I can just go next door and if they have – they give. I’m really happy people don’t sell things here. The supply ship hasn’t been for six months but we don’t cry over rice or steak, we just manage with our coconuts and our fish. But the day the freighter arrives it’s like Christmas Day,” he laughs. Bob is the mayor of Palmerston and lives at one end of the main street. It is a strip of sand no more than 100 meters long and is home to just half a dozen buildings. “This is the main road, no bus stops here, no buses to wait for in Palmerston,” says Bob with a hearty chuckle. In the 1950′s, Lt Cdr Victor Clark’s boat was shipwrecked and he lived on the island for nine months while it was repaired. This experience features heavily in his book, On the Wind of a Dream: A Saga of Solace. When he died aged 97, his daughter Rose made the long journey to Palmerston from her home in Devon to scatter his ashes. “It was his favorite time of life,” she says. And a year after she first arrived, she is still here. During her visit, she was asked to look after the school’s only special needs pupil, a child who has ADHD. 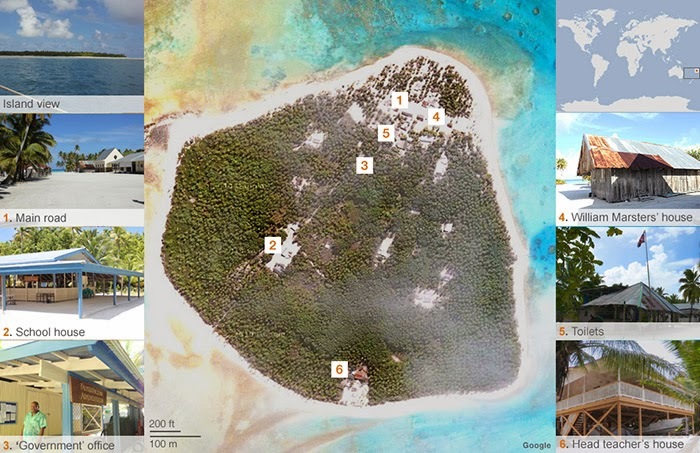 “I initially turned it down because I could not imagine living on a tiny atoll hundreds of miles from the nearest life. But then I realized – that’s what I was doing in the UK, it’d be pretty selfish to leave this little eight-year-old that couldn’t be at school. On the days when there is no school, Rose joins other women to make traditional hats or baskets from palm leaves. More often than not, the group can be heard singing and laughing together. It is a social gathering, but it also highlights the lack of young adults. While the young children do the lifting and unskilled tasks, the older women do the intricate weaving, a skill perfected over many years. But there are no young adults here for the women to pass on their knowledge and family stories to. 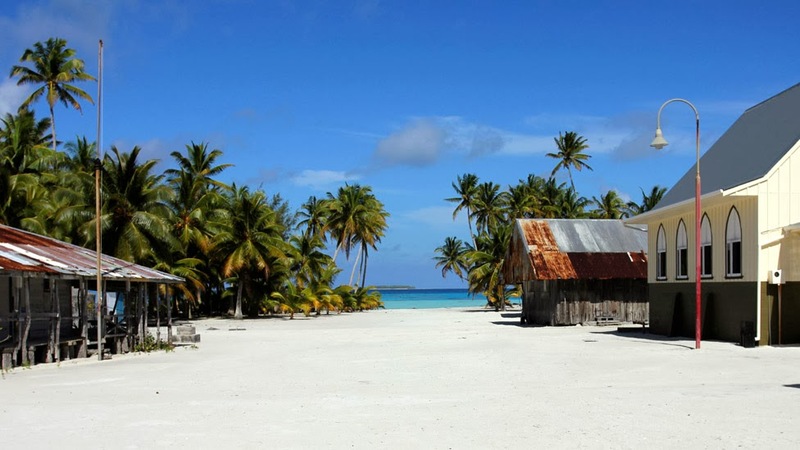 In the evenings, the schoolchildren go swimming or play volleyball, while some of the men gather around the island’s only TV to watch the rugby highlights. The women relax on hammocks, laughing and joking. In all this, alcohol plays no real part. Until the next supply ship makes an appearance, the island is dry. Beer is sometimes brewed, but only for special occasions. Edward, the island’s policeman, is probably the least busy police officer in the world. I ask one of the islanders what would happen if someone was to steal a coconut. So with his spare time, Edward makes things. He’s particularly good at making ukuleles. He uses a piece of wood from the tree they call the mahogany tree, a coconut and fishing line for strings. He also plays them, very well as it happens. As we sit outside his squat house, his brother Simon runs over with a plate of food. “No one fed you lunch yet, eh?” he says, placing it on the table. And so, surrounded by engine parts, coconuts and my third lunch of the day, Edward and his brother Simon sing the Farewell song. It tells of William Marsters’ trip to Palmerston a century and a half ago, when he “sang farewell to happy London town”. As we prepare to leave, Bob appears with a basket of fish. He has been luckier than Bill with his catch and shares it across the whole island. “We share everything with our family,” he says, handing us two fish for the return leg of our journey.